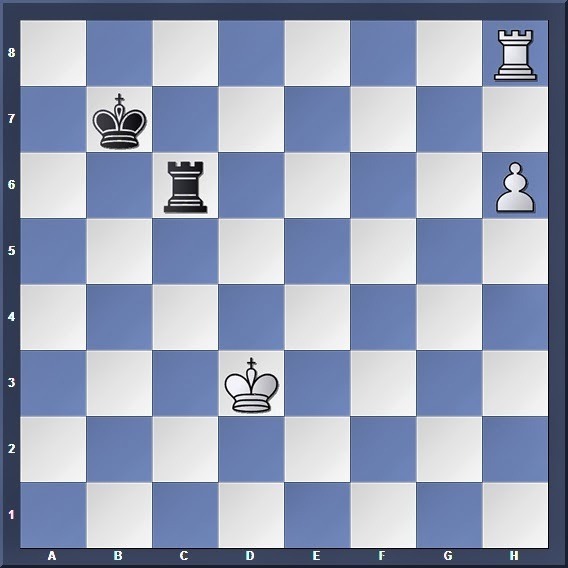 White to move: Can he win? The answer, as most of ye have pointed out, is NO. 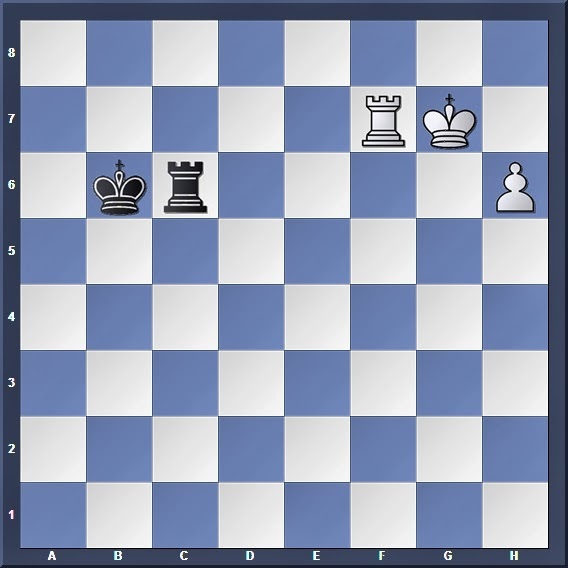 The unfortunate position of White's rook, Black's active rook, and the fact that White's king is away on a holiday is enough to save half a point for Black. But here's the interesting bit: Black draws not because he can keep his rook behind White's pawn (as some of you have pointed out), in fact if he follows the same method the game will end in a win for White. Rather, Black draws because he can set up a Vancura Position, which is a draw for the weaker side. You didn't think I was going to let you get away reading through and forgetting all our previous content, yeah? 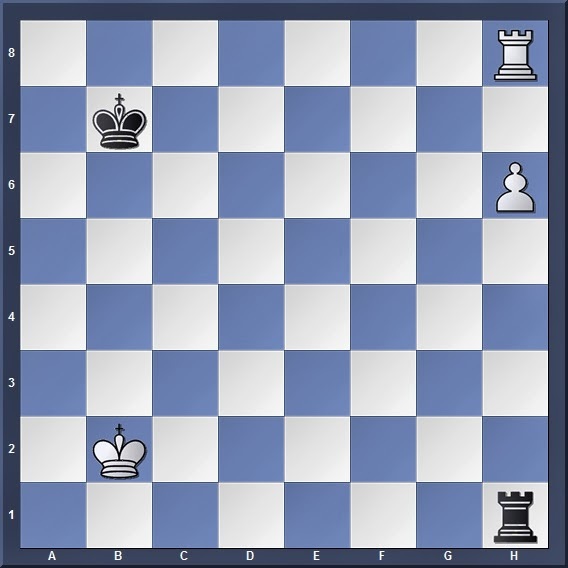 The main reason why this position is different from the one we saw in our previous article (with the pawn on h7), is because the White king now has a shelter on h7 which will prove useful to him. White wins by slowly marching his king towards the g-file, making sure that he stays on the first and second ranks to make sure Black doesn't seize control of that file. Once he has reached the g-file, he can then then march up the file to make contact with his pawn, before exploiting the shelter on h7 to escape from the rook check (which would not have worked had the pawn been on h7) and free his rook from its passive slumber. Desperate counterplay since staying on the g/h files allows Rg8 followed by Rg6, allowing White's king to step aside and let the pawn advance. So now we see why letting the rook stick behind the pawn is no longer effective for Black in this case. But he still has one more weapon hidden under his sleeve, which we have all looked at not long ago: The Vancura Position. Or 1... Rf1/Rg1. The purpose is the same: To leap to the 6th rank where Black can tie down the pawn and deny the White king passage to the h7 square. So that was easy... but some of you might be wondering, does this still apply if the pawn is not a rook pawn? 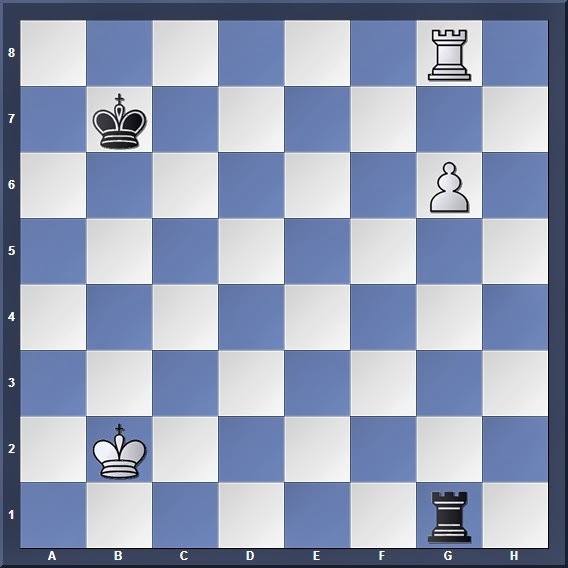 White to move: What happens now? Hiding from the rook checks, and unleashing White's rook into the fray. So is this a losing position for Black? The answer is NO; even though the Vancura Position does not work here, the pawn on g6 is closer to Black's king than the pawn on h6, so Black can (surprisingly) draw by moving his king towards the pawn! Marching slowly towards the prized target on g6, while keeping the rook behind the pawn; although this fails with a rook pawn, it surprisingly works for a non-rook pawn! Played along the same lines as the tactical trap with the pawn on h7; but this time, White cannot hope to exploit the skewer because the enemy king is too close to the pawn. In a position with a rook pawn on the 7th rank, the stronger side's rook in front of the pawn and the stronger side's king too far away to help, the weaker side draws by shuffling his rook behind the enemy pawn. However, care must be taken not to fall for any tactical traps! In a similar position but with the rook pawn on the 6th rank, the weaker side draws by setting up a Vancura Position. In a similar position but with a central pawn instead of a rook pawn, the weaker side cannot draw by setting up a Vancura Position; however, he can draw by rushing his king to the pawn in order to pick it off. Of course, all these is thanks to the passive position of the stronger side's rook, and the active position of its weaker counterpart. By now you should be quite familiar with most of the rook endgame basics, so absorbing these should not be much of a problem for y'all.